It doesn't like revving to 7k after 13.5hrs of racing. We also had the typical crank bolt failure because we didn't clean it off enough before applying loctite during the timing belt change. We'll be keeping our shift points ~6k rpm going forward. Chris, John, Beth ready to challenge them? Sure, as long as their engine is broken! - Dustbuster minivan...preferably mid-engined, powered by a 500ci caddy motor. You can just cut the front frame out of a 70's Eldorado and weld it in the back of the minivan. So easy! - Stripped down dually truck frame with a big block, possibly with ill-fitting sports car body. Inspiration. Think of the power to weight ratio. I think I know a member who has a spare truck frame...not sure if it's dualled, but that's easy to change. - AWD chevy astro van with LT1 power. How can you utilize all that power in a straight line when there's a limit on how sticky the tires can be? AWD. The transfer case in these Astros is the same as was used in the GMC Typhoon/Syclone. Did I mention I have a spare LT1 in my garage? Well after a long break on the car there has been a bit of progress. Here is a recap of how we left you last year. 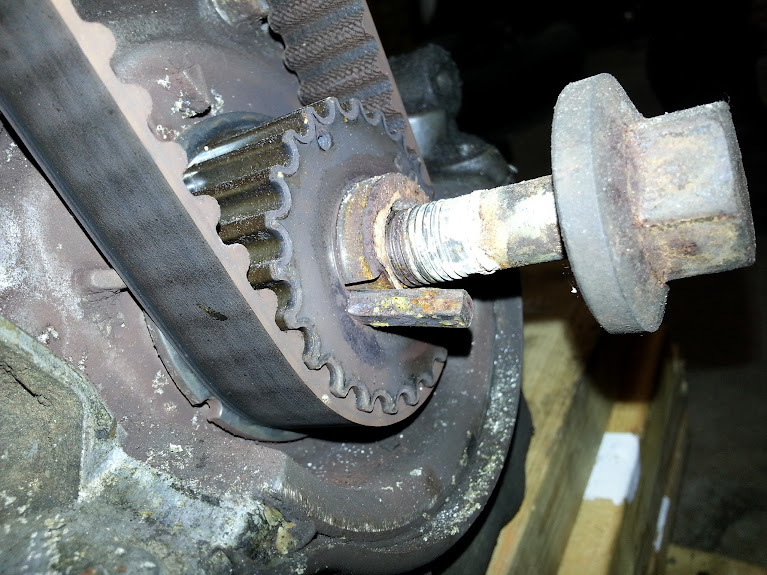 Well found that the keyway on the crank had been wallowed out. Causing the motor to be retarded and create all kinds of havoc. So we ended up going from the 1.6 to a 1.8 Justin had as a spare. Picks of the old motor below. Check out how clean the insides of the old motor where! We decided to refresh the 1.8. Running good oil we think is the key. Not only do we have to swap a bunch of stuff, but as we are finding out, some stuff needs a little adapting, Like the throttle body below. Luckly miatas are easy to work on and they can be simplified some. Did you epoxy the throttle plate screws on? They tend to run for it in high RPM use! The problem was common in Spec Miata but not so much on street driven cars. Well big thanks to Justin and Jeff this time. They where able to get the motor in without a problem. Some start up issues included a big fuel and vacuum leak. 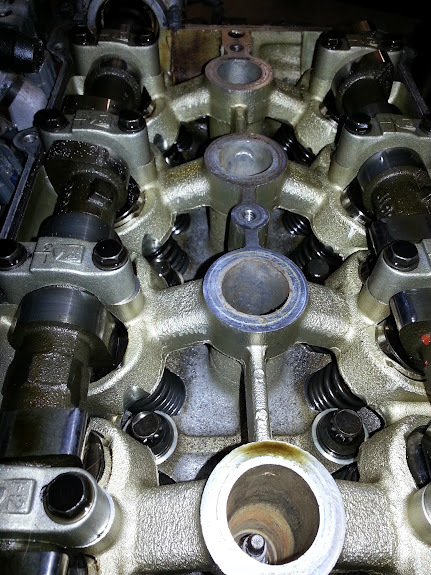 New flow matched injectors solved the fuel leak, and the wandering idle was solved by removing the 1.6 throttle body and adding in a gasket. Now she purrrs at 950rpm at idle and rev's very smooth. Justin reports that a compression test reveals 190 across all cylinders. Very excited to see what happens at dyno day! Got some more sorted on the miata. Big news is that, if you weren't there, we dyno'd at 92 hp with our fresh motor. From what we can tell that looks to be down maybe ten or so because our A/F is so far rich. You can see the torque dropping off at the point where it gets rich. Looking over our spring options for the season. Only a couple weeks before its first outing. Tried leaning the car out some last night with Justin and Mindy. The test was the same each run, holding brakes, WOT in 2nd gear through the whole rpm range to about 7k. Swapped to smaller 1.6 injectors, adjusted idle, o2 plugged in: Small bump in the right direction, still way too rich. Played with the MAF meter a bunch, no real improvement. Could get the car to run good from idle to 4k, then the computer kept adding tons of fuel after that. We noticed that once we started the car it would idle at 15/1 for ~30 seconds then run super rich. So we unplugged the o2 sensor. That leaned it out a lot and stopped that action. From there we played with the MAF meter again to bring it back: Helped but still not right. 16/1 until 5k or so then it started dumping fuel in again, and we saw 10-11/1 all over. Then we tested the TPS, matches what the other 1.6 does on Danielle's car. Then we checked the resistance in the ECU temp sensor. That is also within spec. The last thing we can think of is swapping out the ecu with a known good one as well as unplug the fuel pressure regulator. Yes it has a MAF (Mass Air Flow) meter. Modern cars use a hot wire technique (less restriction), older cars like this one use a "trap door" or "vane" to meter the air coming in. (the more open, the more air) We did test the unit. It typically, like most sensors on a car, it is a 5V signal. In this application at idle it is suppose to sit around 3.5V and wide open .5V or so if I remember correctly. I'm not going to say it doesn't need to be swapped out, we should try, but it does cycle through the voltage range. Our idle is around 2.9V however currently after adjusting based on A/F ratio and idle. Justin and I have been toying with the idea of using a k20 with miata trans... next year maybe. Timing can have a big influence on AFR, have you checked to make sure you are getting the correct advance? Good call. We set initial timing to 14 degrees, but haven't checked what the ECU is doing to it beyond idle. I don't know if the ECU will advance it just with RPM or with RPM and load. Will check and hope we can read something. That is a good call, gotta love the guys that work with megasquirt. Swapping out the ecu may be the easiest thing to do first. Have we looked to see if it is still lean/rich at part throttle and no load? ECU probably changes timing based on load and rpm. Throw the timing light on it and see what happens when you rev it. If you can put marks at 20, 25, and 30 on the crank pulley. Hell jack the rear of the car up, hold the brakes. Put some load on it. Well, after swapping ECU, AFM and disconnecting the TPS with no change, I figured it had to be something mechanical. 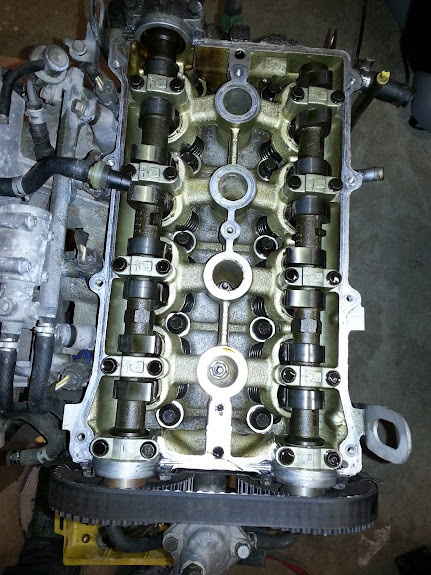 Took the valve cover off and both cams were 1 tooth advanced at TDC...reset the cam timing and now it runs much better. Still rich in higher rpms (like 11:1), but that's much better than the 9:1-10:1 we were seeing. Might keep tweaking here and there before the race, but we should be good to go now. Glad you got it sorted out. 11-1 doesnt sound that bad but if you have anyway to put a little timing in it you could probably get to 13-1. Well, we had a good weekend. All drivers are still alive and the car still runs. We even managed no black flags and a 15th out of 84 finish! Shutting our mouths during BS inspection and bribing the judge with some top shelf Gin resulted in a B-class with 3 penalty lap assessment. Much improved from our A-class with 50 penalty laps we got at the end of last year. There were some pretty awesome cars there, including a 4 door Geo Metro powered by a 3.0L V6 from a Ford Escape mounted in the rear. When that motor blew up, they cannibalized the V6 out of one of a teammate's daily driver SVT Contour. Also, possibly the greatest LeMons racer of all time, SpeedyCop's Spirit of LeMons 1956 Cessna mounted on a Toyota HiAce chassis. Well, we had a good weekend. All drivers are still alive and the car still runs. We even managed no black flags and a 15th out of 84 finish! (The car still runs???) Awesome!! Well as Justin stated we had our best result yet. 15th overall and 7th in our class. Here is how the weekend went. Since this is our 4th event now we kinda know the drill. It ended up being very relaxing really. No tech BS to fix in a moments notice. Pat, Dad and Justin packed up Thursday night so we where able to head out fairly early for our 6 hour drive down south to CMP. Decided to make camp the only what we could since we where missing pieces to Justin's tent. We never where really under it and it was pretty windy so I question the reasoning but none the less. Our tech inspection shortly followed. Meanwhile the "big boys" where on track. It was fun seeing the speed these cars can reach. Then spent the rest of the evening hanging out and talking about all the crazy lemon car we could create. In the morning we had the drivers meeting at around 8am. Pretty simple, they tell you not to die and that is about it. From there it is off the racing at 9. Fuel stops and driver changes between an hour to two hours. By the end of day one we had only two issues. First a new scratch in the paint. And second a coolant temperature sensor failed so the fans weren't kicking on. Rotated tires and our first day was done and we where in 20th place at that time I believe and 8th in our class. Playing another miata and civic as we slowly worked or way up to 15th. All to be followed by a long drive home. Here is a video by Pat and his helmet cam. That is so awesome! The video was cool.